In April 1848 Chopin came to London with thoughts of settling permanently. In the event he went back to Paris in November but planned to return. 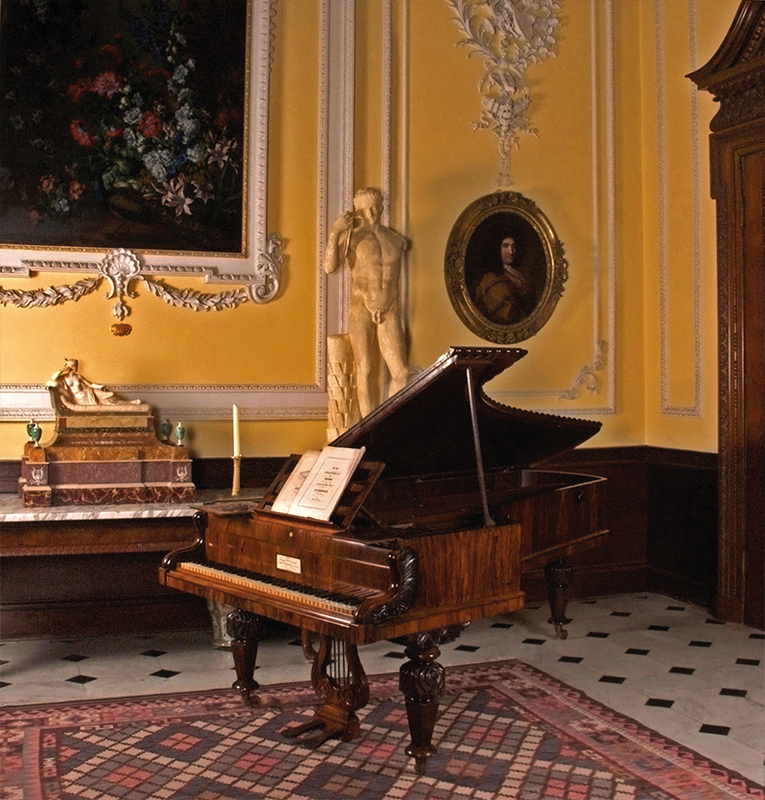 A truly exceptional group of instruments associated with Chopin in Paris, London and Scotland survives in the Cobbe Collection at Hatchlands. These are from the three dominant piano-makers of his age – Camille Pleyel, Pierre Erard and John Fowler Broadwood – all three of whom Chopin knew and who experienced his friendship, comments, praise or criticism. Indeed, whilst in London in 1848, it was a source of considerable pleasure to him that his drawing-room in 48 Dover Street contained a piano by each of these three great makers, a fact to which he made proud allusion in several of his letters. Chopin’s British trip was, for him, one of extraordinarily dense performance activity. He gave more than twice as many concerts, public and private, in his first two months in London as he had done in a decade in Paris. His appearances were very well received by British audiences, who understood that they were experiencing, in his playing, something unique; he appreciated that they didn’t chatter while he played and they benefited from an unusually active Chopin who bestowed on them a large proportion of the 30 or so concerts that he gave in his whole lifetime. Once back in Paris, he never performed in public again. The Paris-manufactured Pleyel grand, No. 13819, now in the Cobbe collection, travelled to England with him. He referred to it as his ‘own’ piano and slept his first nights in a London lodging along with it still in its packing case. It is the instrument on which he probably planned to impress the British public (though Broadwood would have other ideas). He had chosen it for his salon in Paris in January 1848, shortly after its completion in the factory, and in the following month gave on it what would be his last Paris concert, in the Salle Pleyel in February. Once in England it was the piano on which he made his London debut at Gore House, the residence of Lady Blessington and Count d’Orsay. Throughout the London season it stood in his drawing-room in Dover Street where he doubtless used it in his busy teaching curriculum. Chopin performed, however, the majority of his concerts in London and that in Manchester on the London Broadwood concert grand, No. 17047, now on permanent loan to the Cobbe Collection. The composer chose it in the maker’s warehouse, from where it was taken on each occasion to the venues of the concerts he gave on it. 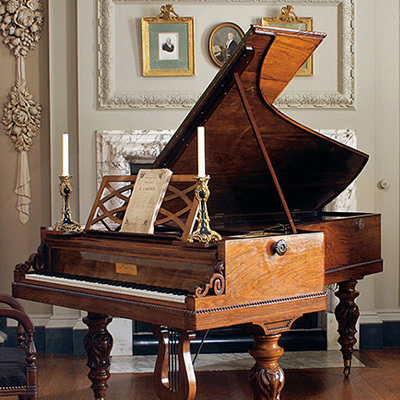 Moreover, Chopin had this Broadwood in his lodging at 4 St James’s Place for ten days preceding his use of it for his concert on 16 November 1848 in the Guildhall, London – his last ever public performance. 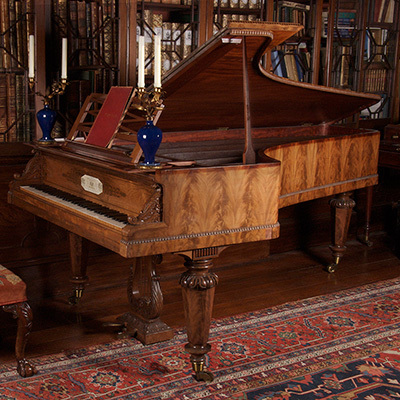 The third piano in the Cobbe Collection, dating from a few years earlier, is an Erard grand, No. 713, manufactured in London, which has a history that is scarcely less interesting. It belonged to Chopin’s friend, pupil, benefactress and de facto executrix Jane Stirling. It was made in 1843, the probable year in which he commenced to teach her. Seeing her, as he did, on an almost daily basis both in Paris, London and Scotland, it is an instrument with which he must have been closely familiar. In October 1848, it was placed in the composer’s private sitting-room while he was staying at the Stirling seat of Keir House, where the piano survived until modern times. These three pianos witnessed Chopin’s exceptional burst of activity on both sides of the English Channel during the last performing year of his life. The Chopin historian Jean-Jacques Eigeldinger has described the group as ‘unique in the world, as brilliant as it is moving’. This entry was posted in Explore and tagged broadwood, Chopin, erard, piano, pleyel by Alexey. Bookmark the permalink.